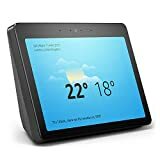 The second-generation Amazon Echo Show (or Echo Show 2 as we are calling it) refines the design, expands the screen of the original and adds a host of extra functions. It’s good timing for the Echo Show. With Google’s Home Hub and the Lenovo Smart Display finally getting a UK release, it looks like we’re beginning to see what might be called a fight for these “smart screens”. To maintain a lead, Amazon is going to have to keep iterating. The idea behind the Echo Show, however, remains the same as it ever was. Essentially, it’s an Alexa-powered smart speaker with a screen added. And that screen gives Alexa a whole new lease of life, adding the ability to watch online videos and carry out video calls among other things. So, what’s new about the Echo 2 Show? It has a larger, sharper 10in screen, improved speakers and microphones than before. And the design is far cleaner than before. It’s also more expensive than the first Echo Show. It’s fair to say that the screen dominates affairs, but Amazon has ensured the new Echo Show doesn’t look overly large by removing the speaker from below the screen and moving it to the rear of the unit. The result is that, although the screen is larger and the speaker has a slightly bigger footprint than its predecessor, it’s actually a little shorter than the original. The overall shape of the speaker is quite familiar, though. It’s still a bit like a mini, misshapen pyramid and it hasn’t entirely lost its gawkiness, either. With a broader bezel above the screen than those to the left, right and below it, it has a lopsided look that’s out of kilter with its ultra-modern smart-home ambitions. That wide bezel is there for a reason, though. It houses not only the speaker’s front-facing camera – which is the same 5-megapixel unit as used in the first Echo Show – but also part of the Show’s far-field microphone array. This is supplemented by a further four microphones on top of the speaker, plus physical mute and volume buttons. In a cut-out at the rear of the speaker are the speaker’s DC power input – like the rest of Amazon’s Echo speakers, the Echo Show is a mains-only speaker and has no battery – and a micro-USB port, but no 3.5mm input or output. So far, so similar. Fire up the Echo Show 2 side by side with the original Echo and it’s clear, though, that the new Show is streets ahead. The screen has better contrast and punch to it, and the touch surface feels smoother and more silky to the touch. In fact, the whole unit has a higher-quality feel to it than the original, and I really like the fabric-covered rear of the speaker. This speaker has a much more modern feel to it. The Echo Show 2 is also a far better-sounding smart speaker than the original. The sound is fuller, more bassy and much, much louder. Is it a match for the Apple HomePod? In a word, no. The bass is too overbearing and boomy for that – indeed, the first thing I did was to use the speaker’s EQ settings to push back the bass; at default settings, I had to turn up the volume far too loud to make voices and vocals discernible across a moderately noisy kitchen. It also doesn’t sound too good when you crank up the volume. It starts distorting a bit and just isn’t the tight control you get with an Apple HomePod or a Google Home Max. And yet, for £220, this is an awful lot of speaker for the money. Remember, not only are you getting the best-sounding standalone Echo speaker around but also a 10in touchscreen and a five-megapixel, front-facing camera. It’s also worth pointing out that the improved microphone array really does work well. The new Echo Show is far more sensitive to the Alexa wake word than before: where I frequently had to repeat “Alexa” with the old Show, I’ve had to do that a whole lot less with the Show 2. The Echo Show 2 has a slightly tweaked UI and a number of new features compared with the first Echo Show, but it still doesn’t make the most of its screen, in my opinion. The first new feature is smart-home control: drag a finger down from the top of the touchscreen, tap the Lights & More option and you’ll see a scrollable list of all your smart-home gear – from lights to cameras – with toggle switches alongside. This is useful because you can’t always remember what your various smart gadgets are called, and you need the right name to be able to voice-control them. It addresses a complaint I’ve had for some time with controlling smart-home devices with smart speakers. I simply don’t have the mental capacity to remember the name of every smart device in my house. The UI looks a little more friendly than before, too, and you can finally browse the web via either Firefox or the Amazon Silk browser, which gives you access to YouTube among other streaming video services. Plus, the ability to video call to Skype users is coming soon, which could prove popular among those who like to keep in contact with loved ones over video link. Largely, though, what the screen on the Show 2 can display is much the same as it was before. It can display lyrics to songs played from Amazon Music. It can show TVs and movies directly from Amazon Prime Video or YouTube. It can patch you through to the live feed from connected security cameras and show visuals to go along with things like your current timers or weather and sports results requests. There’s plenty you might expect it to do that it can’t, however. You can’t watch Netflix, for instance, and there are plenty of irritations with third-party apps, too. Ask the Show to play BBC radio stations, for instance, or anything from the default TuneIn internet radio service, and the onscreen experience leaves a lot to be desired. All you get is some text telling you the current show and station, a rather low-res radio station icon on a vast swathe of plain background and some Alexa tips at the bottom of the screen. It’s such a wasted opportunity it’s almost embarrassing. There’s not even a permanent spot for the time. You have to ask Alexa to “go to the homescreen” if you want to do something as simple as that. Why Amazon hasn’t used the extra screen real estate to display a panel with the time, calendar and weather next to all third-party app data is completely beyond me. Still, approach this as a slightly more feature-rich Echo speaker with video calling and playback features and you probably won’t be too annoyed by it. After all, it works much as any other Echo has done before it, with all the pros and cons that come along with using Alexa as your digital assistant rather than Google Assistant. In summary, Google Assistant is better at answering questions than Alexa, and it’s better at understanding what you’re asking it as well. But Alexa is better at doing the basics. Through its Skills, it’s directly compatible with many more items of smart-home hardware. Its support for the intercom-style Drop In feature, video calls and Echo to Alexa app calls is a feature other smart speakers can't match, either. And remember: Amazon reserves Alexa-based calling for its own Echo speakers, which means you won’t find this feature on third-party devices like the Sonos One, either. Overall, the Echo Show 2 is a big improvement on the original. The screen is bigger and brighter, and the quality is better. It looks and feels nicer to use, too, and it sounds pretty damned good, all things considered, not to mention that the microphone array is more sensitive. It's still, on balance, my pick of the Echo speakers. However, I can’t help but hanker after a slicker smart screen experience. With that big 10" display, Amazon could have worked wonders; it could have fixed all the problems I have with the original. Instead, it played it safe and the result is a little disappointing.